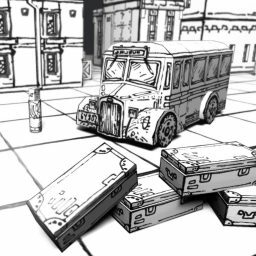 Hoopworld is an older project I worked on – but the stylized textures still hold up very well. Here’s a first batch of them. I have all this work lying around here ready to go for years… but I understand why I procrastinated: It’s a loooot to put together. I think I can make four or five postings – including some tutorials about the style and how we did the textures. 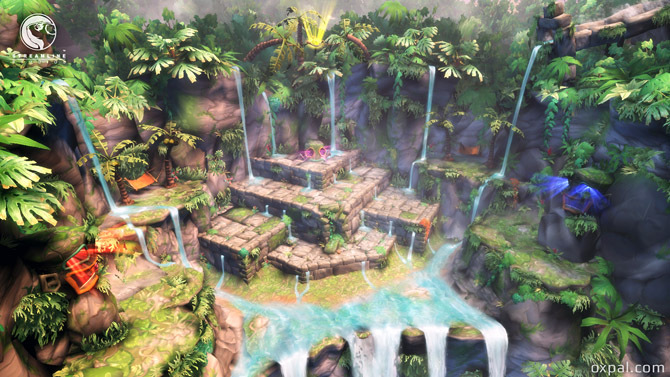 Let’s start with a pretty picture of the oasis level. Later the game went through a lot iterations of the layout because of the gameplay. First I want to give an overview – showing different elements and how the look came together. 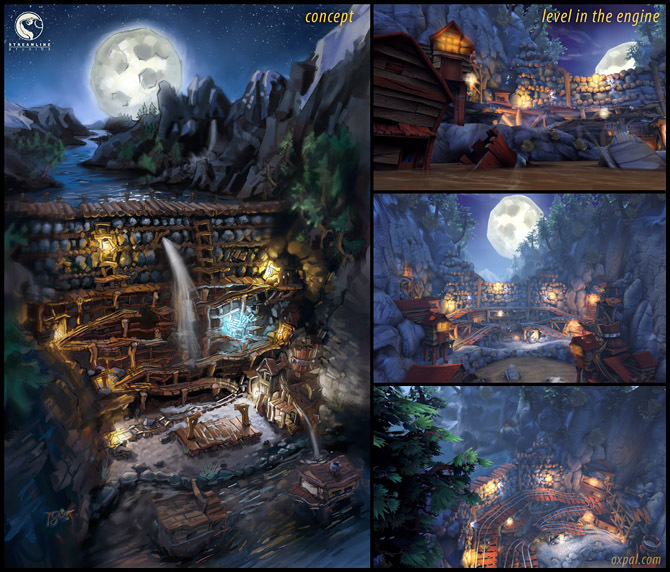 Here is a level, first as concept and later how it looked in the game. The idea was to transport the painted look straight through. 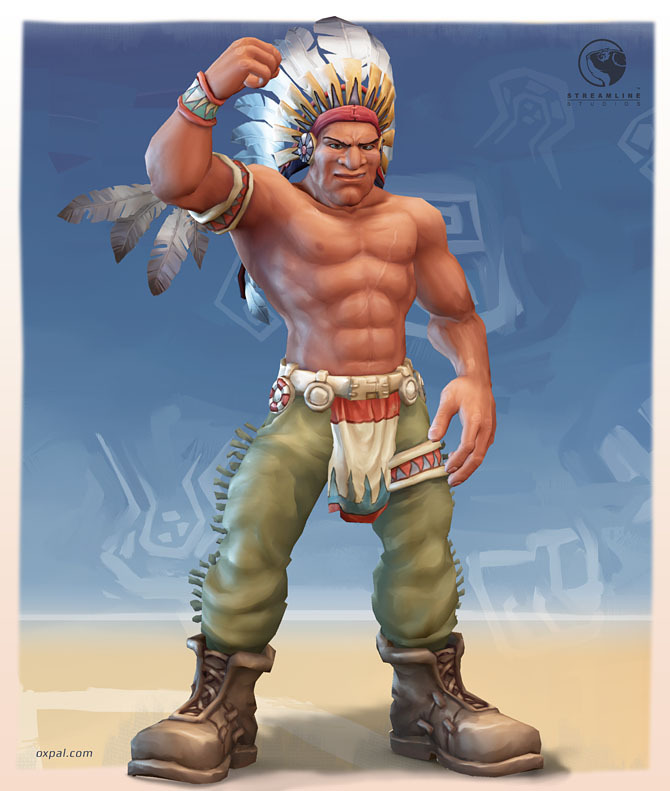 Here is a good example how the game went from concept to game – while trying to keep the painted look throughout. For that we also painted the textures without using photos as is more common in game production. Here are some of the rocks I made for the level above. 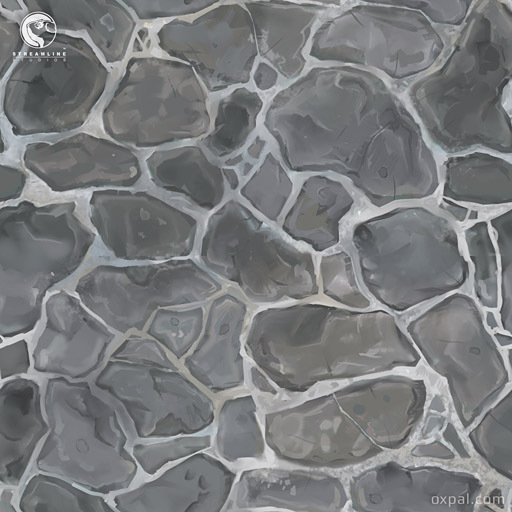 And a cobble stone texture. 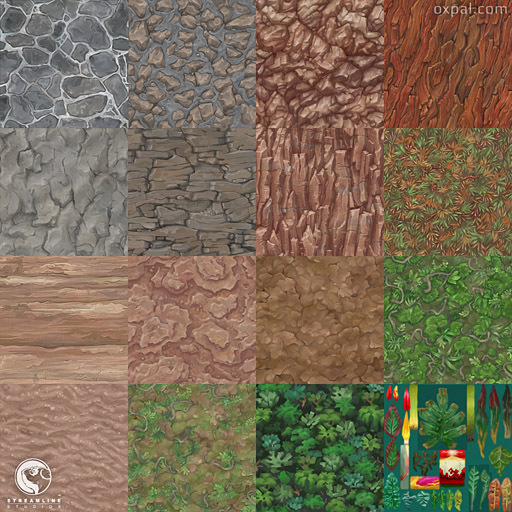 Here is an overview over some of the textures I did for the game. I’ll show some more and add a step-by-step for creating this style in a later article. The background were these tiling textures. But the process was similar for the objects: More details and effects on the texture, less on the mesh. 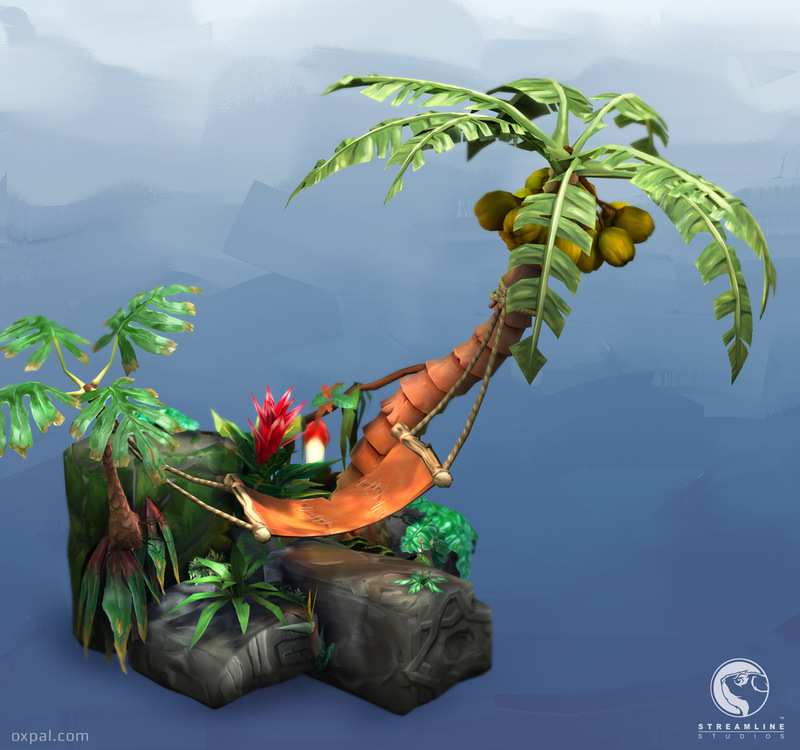 Plant textures for the jungle on top of the article. 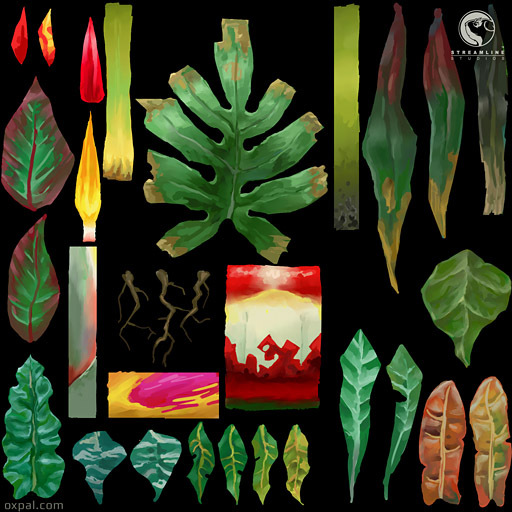 A view of how the plant textures look in the game. We did the characters in the same way – with a special shader that limited the interference from local lights. Lot’s of this work was done by Hector Moran – including the concept for this character. 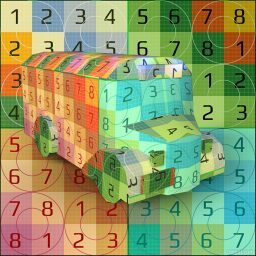 The mesh is (if I remember correctly) by Renier Banninga, and I did the texture. 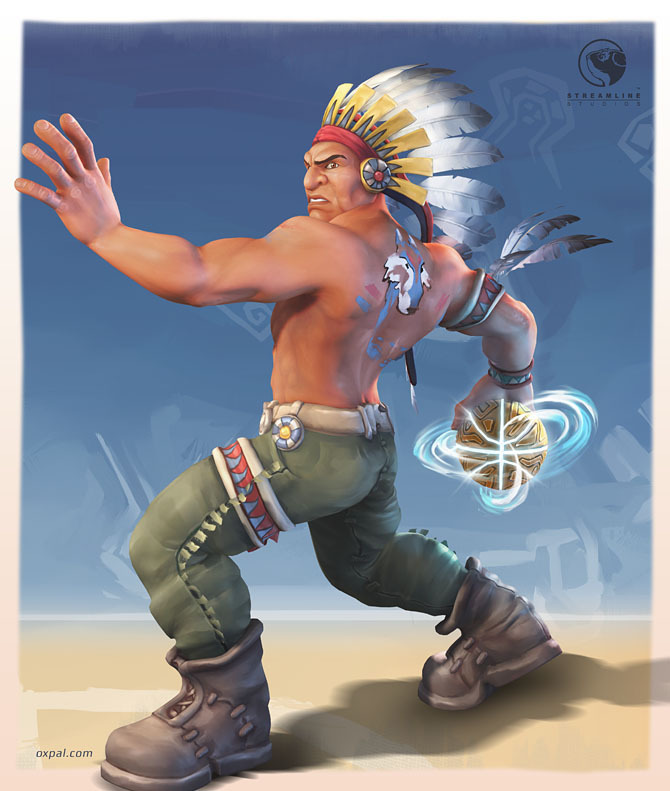 The Chief – one of the characters playing the tough version of basketball. The three texture sheets for the character. This is some great stuff, I love it! I’m showing this to my students in a game art college curriculum, for examples of good handpainted textures. 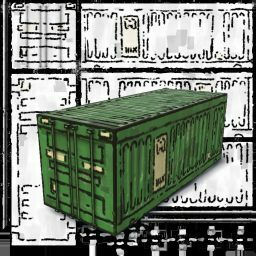 I hope you find the time to post more art, tuts, and textures from this game. Thanks for sharing! Thanks Jarien, glad you like it. 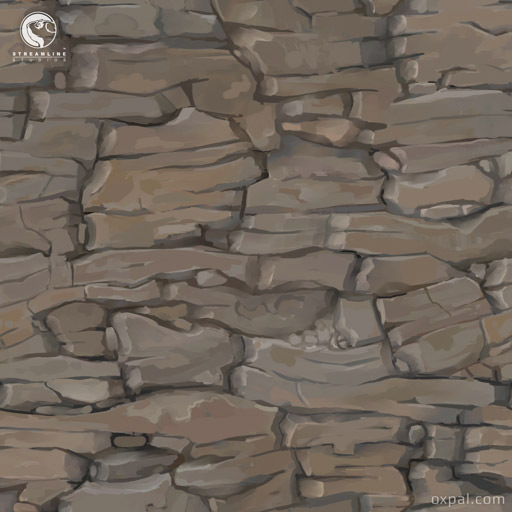 I have some step-by-steps for the texture painting for this game lying around, just didn’t get to post it yet. Will do that when I find the time. Hello Thomas, also loved the art style used for this game. Any chance you are still working on the tutorial process to post on your blog? Hey Abdy, cool to hear you like it. I have put it on the ‘backburner’ (for a year ;)). But I’ll try to finish it – seeing that it’s a repeated request.